Jung’s eight function-attitudes fall naturally into three groupings according to how their positions in each type’s preference hierarchy influence their development potential: 1) dominant and auxiliary; 2) tertiary and inferior; and 3) the shadow (or “ego-dystonic”) functions. Group one, comprised of the dominant (#1) and auxiliary (#2), delineates the most comfortable and energizing mental processes, so they are normally the first to be differentiated into conscious use and developed as habitual modes of operating. For most of us, these two function-attitudes (FAs) not only become our “default settings,” by early adulthood they have formed the typological core of our identity—of our ego. The second group is comprised of the tertiary (#3) and inferior (#4). These are “ego-syntonic” as well—meaning that they too have the potential to mesh with and supplement the ego. There is, of course, always going to be tension between sensation and intuition, thinking and feeling, extraversion and introversion, and judgment and perception. Because of the particular attitudes of the ego-syntonic four, however, they do not negate each other; none of them challenge our ego-sense of “who I am.” For an INTP, for example, inferior extraverted feeling (Fe) certainly has a different approach to judging than dominant introverted thinking (Ti). But integrating the Fe mode does not require one to abandon the Ti approach. Well-differentiated extraverted feeling can supplement and enhance introverted thinking’s capabilities. Likewise, INTP individuals can develop their tertiary introverted sensing (Si) to complement their extraverted intuiting (Ne) auxiliary function. Many mature adults have in fact developed their tertiary and inferior FAs to some level of conscious use and have integrated them to some degree into the ego team. The characteristic that defines this second group, then, is that it indicates the areas where most of our potential for psychological growth through type development lies. The third group includes the four remaining, least-preferred function-attitudes, which are “ego-dystonic” in that they directly contradict the orientation of the ego because their attitudes are opposite from those of the ego-syntonic FAs. They challenge the cohesive integrity of the ego and undermine its confidence. For our INTP example, the opposite-attitude “shadow” of the introverted thinking dominant is extraverted thinking, fifth in the sequence. Despite their common way of operating, the fact that their orientations—one focusing on the personal experience and the other on experiencing the environment—are diametrically opposite makes them virtually mutually exclusive. One can’t engage the introverted and extraverted versions of a function simultaneously any more than we can look north and south at the same time. And of course, the one we naturally favor and have success with is the one we’re going to develop into conscious use, while its opposite-attitude sibling remains in shadow, usually poorly developed, and still laden with unconscious associations. Typically, the ego-dystonic function-attitudes can never be truly developed in a way that allows them to be incorporated into the ego team. “Development” for these FAs is more about simply accepting them as what they are, archetypal baggage and all, and then about learning to use them in defense of the self in more appropriate and socially acceptable ways and with some minimal degree of conscious intention. The four function-attitudes of this third group are the ones that we tend to perceive as “Not Me” because they not only focus on what the ego regards as the wrong stuff, they tend to be carried by uncivilized, socially unacceptable “archetypal” energies. This triune division of the function-attitudes and the archetypes that carry them seems to reflect a “Me, Spirit, and Other” configuration—what Jung might have seen as Ego, Anima/Animus, and Shadow. The three levels describe, as typologist Adam Frey has noted, our areas of “strength, of vulnerability and creativity, and of defense,” respectively (personal communication, November 11, 2015). And it seems like more than a coincidence that this configuration has parallels in most traditional world views, as “Earth, Heaven, and Underworld.” From both the psychological/typological perspective and the traditional religious/philosophical view, these triads seem to be describing essentially the same areas of experience: 1) the reality of everyday experience, 2) the “higher” consciousness that we aspire to and which seems attainable, and 3) the primitive, frightening reality that we’d like to ignore but that is ever-present in the shadows. It seems possible that this aspect of the typological system could in fact be the psychological basis for this traditional cosmological theme of “Earth, Heaven, Underworld” in the arts, philosophies, and religions of diverse cultures. Might this traditional three-fold scheme reflect the three tiers of the function-attitudes within us? 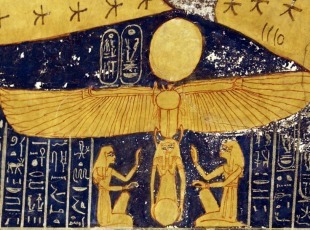 “Rebirth of the Sun.” Cult of the Ancient Gods, from The Book of the Day, tomb of Rameses VI. Certainly an analogy one can argue for. I guess it’s a nice coincidence that there are two articles relating typology and religion and/or spirituality! As I understand it, the similarity between earth/main FA, underworld/shadow is more obvious, but I do think heaven/inspirational FA can work. Perhaps one of the similarities is that reaching heaven is often associated with death/fear of leaving this world, which might be argued similar to the temptation to cling to the 2 FA most readily associated to the ego-consciousness. The analogy goes further if one considers Christian ideas like “being made in the image of God” marking the ultimate purpose of the ego’s journey, that is, to recognize that connection more deeply (in Jungian theory and also in eastern mysticism, this is associated with moving towards a deeper connection to the larger Self than the initially limited prism of ego-consciousness provides). In this sense, the journey to heaven could be likened to discovering FA 3-4. I am not a frequenter of this site, but have been asked by a colleague to read your piece for what you wrote about INTPs. I wonder whether in making your statement you had consulted INTPs for their understanding of their experiences, or whether you speculated from ideology/belief? Your piece appears to imply that extraverted thinking, as opposing function, is more difficult to access than extraverted feeling, the inferior (as Jung identifies it, anyway. If this were true, then Keirseyan temperaments wouldn’t work at all, yet they do. It also leaves aside the reality of discourse for me in that a conversation with anyone preferring any version of thinking, dominant or auxiliary, is usually easy, productive, relaxing. My male friends all prefer variants of extraverted thinking as dominant and auxiliary. Discussing issues with people who prefer extraverted feeling (dominant or auxiliary) is much more fraught, notwithstanding growing up in a family were females, as well as women in relationship who just about all fall under this category. I wonder also why you chose INTP for your example, and not your own type, which would be easier to explain. People everywhere seem to find INTPs difficult; for many years now, I have been asked by parents and partners to explain their INTP child or spouse to them and I’m pleased to oblige particularly as I’m more than happy to tell you what my type might be like. One of my inquisitors was Katharine Myers. Other INTPs in the type community have also experienced this curiosity/frustration (call it what you will). As a student of religions for some 40 years, I also find your analogy dubious, for historical and theological reasons, as well as Jungian, but that’s a sideshow to the real,event which is understanding people for who they are. It’s difficult enough to be an INTP in this society in the first place (speculative types of predator technology capitalists notwithstanding) without people being misled in this way, however well-meaning in intent. I am an older person, and can manage most therapeutic sessions where a mistake is made about who I am and I know who I am. I am concerned for younger people, who may not be robust enough about themselves to challenge presumptions than extraverted thinking is beyond them, and extraverted feeling is easier, which is how i read your piece. Jung says in places all too numerous to mention that he had no method, but responded to the person. I don’t doubt that the therapeutic method or model favoured in this place has insights and benefits, but claims like this isn’t one of them and perhaps what Jung meant by opposing function should be rethought. I don’t have the answer to that. I actually agree with you that my suggestion that a heaven/earth/underworld cosmology might reflect the development potentialities of type’s hierarchy of preference could be called “dubious”—though I would have said “highly speculative” instead. The center column articles of this journal, usually written by Carol or myself, are intended as conversation starters. It’s a place where ideas can be aired for discussion without necessarily being backed by a preponderance of evidence and without even necessarily being fully formed, in the hope of gathering insight from others and perhaps thus either adding detail and/or evidence for it or against it. In this case, my introverted intuitive dominant saw a possible pattern commonality and my extraverted thinking auxiliary wanted to explore the idea with others. It’s distressing to me to hear that you interpreted my words as picking on INTPs. Not only do I try to be careful not to say things in ways that others will interpret as putting down a type, I genuinely don’t even think that way. Like anyone who has some knowledge of typology and who pays attention to their own interactions, I find that certain types (not INTP) are more consistently challenging for me than other types tend to be. But that’s a product of how those people’s typologies tend to trigger my own type-related shortcomings. It has never even occurred to me that any type might be inherently more problematic or “difficult” than any other. And rereading what I wrote in the article, I can not for the life of me see how you could possibly have interpreted it that way. I gave a specific example because I find that doing so usually helps clarify a theoretical point. In my writings, if a point is theoretical—about how the dynamics of type might be expected to usually play out—I try to vary which types I use as examples. Here, I chose INTP simply because I don’t recall having used INTP as an example recently. If I had been writing about how an individual of a certain type might experience a type dynamic, I would indeed have used my own type and my own experience as the example; or if I had personal knowledge of someone else’s experience (and their permission), I might have used that example. But in this instance I was doing nothing of the kind. I simply talked about the dominant/inferior and the auxiliary/tertiary and ego/shadow relationships, using specific function-attitudes, the FAs of an INTP typology, as concrete examples. And there is nothing negative either stated or implied. 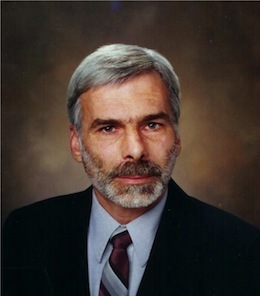 There’s a difference between type bashing and realistically discussing the challenges that the types tend to face, along with their “gifts.” To say that every type’s four least-preferred (ego-dystonic) function-attitudes can probably not be developed into conscious use and ego compatibility in the same way that the ego-syntonic FAs can is not only theoretically self-evident, but also substantiated by most people’s experience. Notable exceptions, like Jung’s obvious high development of both Te and Ti, are notable precisely because they are unusual. But they also demonstrate the reality that high development of ego-dystonic FAs is indeed possible. My point (not fully fleshed out here due to the brevity of the article format and because it isn’t central to my thesis) is not that shadow function-attitudes cannot ever be developed or used adroitly, but rather that such development A) is unusual due to the dynamics of type and B) can probably never be brought to quite the same level of fruition and integration as it potentially could if the FAs were ego-syntonic. On the issue of opposing function-attitudes, Jung definitely seemed to agree with Mark here on one point, namely that he felt that the opposite attitude of the same function type would be the toughest to understand, even more so than a member of the inferior function-attitude type. Von Franz mentions this in Lectures on Jung’s Typology, giving the example of whether an introverted feeling type has more issues with the extraverted thinking type or with the extraverted feeling type. To be balanced, I personally think this is a murky territory though, and one has to be really careful. Jung *also* clearly suggests that the chief repression of each function-attitude type falls on the inferior function: that is, feeling for the introverted or extraverted thinking type, sensation for the introverted intuitive, and so on! And I think emphasizing this viewpoint is where Peter’s discomfort with the particular formulation of opposing FA presented here may be coming in. Jung didn’t tend to make every last thing about the eight function-attitudes, and to a larger extent than in the Beebe school of thought, seemed to mark the differences among the four functions and the common points all thinking types share, and so on. What’s more, in Jung’s model of the psyche, feeling in a thinking type in general fell to the shadow. Basically I don’t think one can justify Jung’s viewpoint that a Fi type would find Fe harder to understand than Te by appealing to the principle of opposition/exclusion, north/south — I think that principle equally applies to the thinking-feeling divide as it does to the extraverted/introverted thinking divide (one can’t extravert one’s thinking while introverting it — true statement — but equally, one cannot deploy feeling while thinking), at least purely on a logical consistency basis (but an appeal to experience and practice is certainly something one can do, even if everyone won’t agree with it — and probably is why Beebe favors his model, i.e. he finds it tends to be the case). On the analogy presented in the article, I guess I fail to see what’s so “dubious” about it. I would say if someone presented it as more than an interesting association, yes one could call it dubious. But as an association, it seems pretty conceptually natural. As for the issue of “picking on INTPs,” I agree with Mark that one cannot reasonably read the article as doing that. However, I think it also appears reasonable to read Peter as not saying that any “picking on” is going on. In particular, his point seems to be (my best understanding/attempt) that INTPs in his experience are often misunderstood, and that young INTPs who have not yet developed a strong sense of self may be more prone to being swept away by this misunderstanding than others. That said, I don’t think Mark’s point had almost anything really to do with INTPs in particular, and that it was more or less a formal/structural argument that would’ve worked equally well with an ISFP (claiming, instead, that they would have a hard time accessing extraverted feeling and/or understanding it). So it seems to me as an onlooker that, if Mark/Peter have anything to discuss, it isn’t misunderstandings about INTPs so much as discussing what the fundamental axioms of typology “ought” to be, discussing this subtle/murky region of Jung’s claims (among the many things he left somewhat open to interpretation), based on whatever admixture of purer structural contemplation or practical experience they deem appropriate. In responding to responses to my response (couldn’t resist that, sorry) I was reminded of why I don’t like to engage in this kind of discourse, notwithstanding the content of the responses. ptypes, I would have liked to have been addressed directly, rather than the subject/object of a discussion(take your pick). If you’ve ever been in a hospital bed with doctors discussing you without engaging you, you’ll have an idea of how that read. If you’re a woman, then that kind of experience might be all too regular. Not a big deal, just a comment on discourse method. Mark, I realise you had no malign intent and INTP was just your example. It was simply that which drew me to comment, albeit by outside request.I’ll get back to that after the Heaven, Earth etc allusion. I called the discussion dubious because it appears that way to me. I’ve got no problems with what you call it here, other than I’m not keen on such speculations;I’ve never been keen on shooting the breeze in that way. An element of my doubt also relates to my view that too much is made of Jung’s typology in certain discourses. At one time a long way back it was dividing the brain into the four functions or left-brain/right brain analogies; here we’re in the realm of myth, which is convoluted enough anyway without attempting to impose other frameworks on it. This particular imposition also depends on acceptance of John Beebe’s 8-function model, of which I am not a devotee, preferring a simpler approach. I am not closed to it, just don’t think it makes sense on empirical/observational grounds. I could be completely wrong, of course, and perhaps an epiphany awaits. This includes the alternate directions of the functions as well as the breaking of them into their 8 components and subsequent location.To be honest, I am always looking for the data that will get me to change my mind, given so many appear convinced, but alas, I am probably in 1942 somewhere. My views in this regard also preclude the anthropomorphisation of function labels, a general method (my mentor Otto Kroeger had his own version) and so I try and avoid explanations like yours, Mark, which say that a function did this and another one then did that. I am much more comfortable with someone saying they did something, rather than a label. Jung points out that the basic functions have nothing to do with bodily functions. I realise that challenges much discourse and practice, but there it is.If the preferences (Myers’ term) are content-free (Jung’s perspective) then this practice can be problematic, particularly if someone allocated the wrong function or attitude to a particular behaviour, theirs or others. I haven’t sought to trawl though the material written by Jung regarding the opposing function,although I have read one or two brief comments of his. But from what’s said here, a key associated word is “understand.” Now that’s different to an individual’s development of a function and appears to be whether one person cannot understand how another operates if, say one has a dominant or superior function of introverted thinking and another uses the opposing function. If Jung, or anyone else, means that the one cannot grasp the method of the other, then they’re incorrect in that you can learn to understand where the other is coming from even if it may be foreign to who that person is. I’ve got a fair idea of what extraverted thinking is and I think I use it regularly, with effect, but I don’t spend my time evaluating whether I’m using an extraverted or introverted version. I can even use extraverted feeling (I’ve just got back from the supermarket) on occasion. So, in my ignorance, I would like to know what Jung means. We have lots of information available these days on the different kinds of people, and maybe he wasn’t considering that such information would be available. In a therapeutic situation, it might be particularly relevant, particularly if you have to deal with extraverted thinking oriented models, or which there are quite a few. I don’t know, just doing my own kind of speculating. My concerns actually relate to ideas about social adjustment i.e. how people are supposed to adjust and what they’re supposed to adjust to, and what is being imposed on all sorts of types, not simply my type. Because I am called upon to explain INTPs to others, themselves quite a range of types, with some quite type knowledgeable people asking questions, I am wary about people making claims about this group to which I belong which don’t appear to be all that correct, or all that helpful. I think I’ve rambled a bit. I’m quite happy to leave the discussion and speculation, having made my point, but if people want to discusss further, I will. My personal website is essentially moribund, but it still workd and I can be contacted that way. @Peter — fair enough; I suppose I was just responding with a jumble of thoughts, some points just my own, some in response to Mark or you. But I certainly could phrase my references in the second rather than third person, and will keep this mind in future discussions with you. Here’s some reaction to what you’ve written, although I certainly don’t expect anyone to be around to read it necessarily at least. The comment of Jung’s on opposing function-attitudes is unfortunately just a paraphrase of von Franz (sorry, I just don’t know any other place Jung talks about this), but as they knew each other quite well, I’d expect it’s quite faithful to the spirit. I think the very key there is that Jung meant it’s hard to understand the opposite function-attitude *type* — not that the process itself is somehow inaccessible. Actually on this point, I tend to personally greatly favor Jung over other interpretations, in that he tended (as I emphasized in the past comment) to speak of the four simple psychological functions, without always saying Ti this and Te that or Se this and Si that. If you were a thinking type, you were a thinking type — there wasn’t some kind of necessity of viewing introverted thinking as a separate process from extraverted thinking, even if that was also a good way of looking at things many times. Jung certainly believed that the function, e.g. of thinking in an introverted thinking dominant, isn’t “always” deployed with introverted factors in mind — it tends to go here and there, depending on what is necessary, but as he emphasized, always in the decisive points it is oriented by the subjective factor. And Jung also thought of things like introverted/extraverted thinking in degrees, not binary (i.e. it makes sense to call X more of an introverted thinker than Y, rather than just saying if they use introverted or extraverted thinking). And he certainly didn’t think the difficulty in understanding the opposite function-attitude type amounted to an inability to generally get where they’re coming from — von Franz goes on in that same passage to in fact say the typology is exactly an attempt to bridge this gap. So in summary, he neither meant (1) a total impasse in terms of understanding the opposite function-attitude type at all, nor (2) some kind of “severe limitation/prohibition” on extraverted thinking access for introverted thinking types as if it’s a hidden process severed away from their potential for access. I think Jung even says at some point that extraversion of thinking doesn’t change the actual logic of thought, and speaks more to a difference in temperament between thinkers. In other words, the two members of the opposite types might find each others’ general psychologies hard to understand, but this didn’t somehow diminish that thinking is, to some extent, thinking, and thus by inference, they’d be able to follow each others’ logic of thought, perhaps quite a bit better than they could use the feeling function. If anything, the process they repressed the most seemed to be the inferior function. So once again, there’s a bit of a distinction to draw perhaps between what’s the most repressed process and what’s the type whose psychology is hardest to relate to. Here I am again, after promising to disappear; here that’s called doing a Madam Melba, which is possibly like Eagles farewell tours. ptypes, I would much rather you had a name; it doesn’t help discourse, as I see it anyway, although that will be moot shortly. I’m doubtful that “function-attitudes” can be used in regard to Jung, although interpreters of Jung can obviously have their own terminology. He seems by and large to have used function types and attitude types separately and when he does that there’s a different emphasis. In his letters he says that his concepts are merely names for particular kinds of experiences, and so his attachment to them may be different to particular type discourse today. There is a comment somewhere by Jung on the opposing function;there may even be more than one for all I know. It’s not in the usual indexes. So it’s not just an allusion by von Franz. When Jung writes “basic” function” he does not appear to mean “simple” but “fundamental” and of course there are 4 or them only for specific reasons he gives and which Jacobi comments as him expressing the archetype of 4, the number that’s at the core of his investigations and which is comments is something that’s there, that he didn’t make up. There are many other functions, of course and he uses the word liberally, in many contexts as you would expect from someone of his time. I’ve written and spoken on this. I think it’s always useful to take someone seriously when they’re expressing something about their own idea. I’d probably say of myself that I’m an introverted thinker, possibly add with intuition, but not necessarily so. When I say that, I’m talking about my conscious psychological orientation and not use, although some of that can be inferred. If you’ve completed Mark Majors” Elements, you’ll find something about order of use of preferences, which is really very interesting; it doesn’t claim to say anything about your psychological orientation, though, just use of functions according to his measurement strategies.I like his idea, actually. I thought this morning that an understanding of the opposing function might come in specific ways. For example, economic theorists usually postulate homo economicus,and base their modelling on that. The cognitive sciences don’t have a model of personality per se, but they presume an opposition of thinking and emotion that favours something along the lines of extraverted thinking. I find these propositions poorly thought out and annoying. It doesn’t mean that all extraverted thinking results in these kinds of ideas or that such thinking is always going to be unacceptable to me. One might see a similar difference in the internal harmony associated with introverted feeling and the external harmony associated with extraverted feeling. It’s more complex than that, obviously particularly as I’m recalling a great, late friend well-versed in type who as an ISFP struggled to find similarities of any kind with any INFP he met. Maybe it’s because he was a banker, who knows? Although I’m a fan of Marie-Louise von Franz,I would draw the line on accepting what she says carte blanche regarding Jung. This is because of the variability of interest and powers of observation. Von Franz, for instance, thinks Jung an introverted thinker, Aniela Jaffe sees him as an introverted intuitive, Van Der Hoop thinks Jung as a thinker with sensation; I can’t recall what Jacobi says, if anything. I don’t care for Hillman, although I liked a couple of his books, but I’m interested in Jung, not him and find some of his mythological presuppositions to be dubious. He doesn’t like type, anyway. Australian Jungians are essentially Hillmanians with what appears to be a sprinkling of theosophy and a ransacking of various traditions or fantasies. But I digress. I might end with that expression of bias, and depart from here. This comment is for Mark. Hi Mark, I appreciated your article above. I’m fairly new to MBTI and Jungian psychology, and your thoughts served as an instructive example of the internal dynamics of type. Of course I don’t take your thoughts as empirically researched and evidenced; as you conveyed above, this is an informal space and, as I see it, more like a well-versed and knowledgeable salon than a laboratory. Your article provided a useful exercise in thinking in terms of the 8-function model, which I’m still learning about. If it fits my personal experience, I’ll keep it, if not, no harm done. Also, I didn’t get the impression that you were type-bashing. I think you responded graciously and sincerely. Good job in the comment section and keep up the good work.